In 'Building A Performance' popular UK demonstrator Richard Bower illustrates how, by making small changes in the way you approach a new piece of music, you can transform a basic tune into a performance. Richard’s years of experience shine through in this workshop which is packed with good ideas and common sense advice." There are more than four! Why use O.T.S. as a foundation? Making more than four variations. Listening for the right variation. Taking parts out of a style. 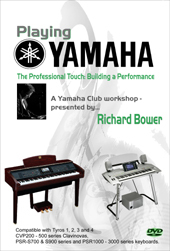 Yamaha PSR-1000, PSR-1100, PSR-1500, PSR-2000, PSR-2100, PSR-3000, PSR-S700 and PSR-S900 series, Tyros (1), Tyros2, Tyros3 and Tyros4 keyboards.